▸ Where can I buy Goldberg Brothers barn door hardware? Visit our interactive map to find a retail dealer near you. Our map does not include some of the dealers that buy our products through wholesale distributors. So, if you do not see a dealer near you on the map, call your local building supply store or lumberyard and ask if they stock our products, or contact the nearest wholesale distributor for further assistance. ▸ I live outside the USA. Can I buy your barn door hardware? Our barn door hardware products are sold by retail dealers in the USA and Canada. Our products can also be shipped to most of the Caribbean Islands from a few dealers in the coastal southeast USA. Shipping policies are determined by individual dealers. ▸ May I buy directly from the factory in Colorado? No. Goldberg Brothers, Inc. does not have a showroom or retail store for selling barn door hardware products at our factory. Please purchase from a retail dealer near you. ▸ May I tour your factory? Not yet. We only recently moved to our current headquarters and we are still getting settled. We do not have a showroom and we do not offer retail sales. Eventually, we do plan to offer factory tours for small groups. We will make an announcement when we are ready to conduct tours. ▸ Can I install Goldberg Brothers barn door hardware myself? If you are experienced with construction, remodeling, or major home repairs, you should be able to install our products yourself. You need to make sure that the wall above your doorway is prepared to handle the weight of the hardware and door. Installation requires accurate measurements for proper fit and function. The work involves using power tools and standing on a ladder. You will probably need an assistant if you have a heavy door. If you have any doubts about your skills or if you do not know how to follow our installation instructions, we recommend that you get a professional installer to do the work for you. Keep in mind that our warranty does not cover any damage or personal injuries resulting from improper installation. ▸ What colors are available? All Stainless Steel Series hardware sets are made from solid stainless steel with a #4 brushed finish. No color options are available. 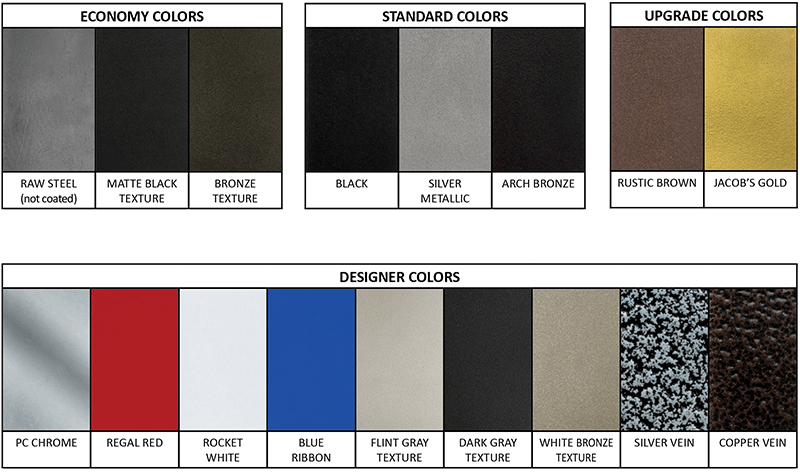 Our Standard Series and Shutter Series hardware sets and track are available in raw steel or any of 16 powder coat colors: Matte Black Texture, Bronze Texture, Black, Silver Metallic, Arch Bronze, Rustic Brown, Jacob's Gold, PC Chrome, Regal Red, Rocket White, Blue Ribbon, Flint Gray Texture, Dark Gray Texture, White Bronze Texture, Siver Vein, and Copper Vein. Our MP Series and Hidden Roller Series sets and track are available in Black, Silver Metallic, and Arch Bronze. See the chart below for color samples. • Due to variations in printers and display screens, all color representations above are approximate. Color sample cards are available. See your Goldberg Brothers retail dealer. • Raw steel does not have a protective coating. Rusting will occur. • PC Chrome is a powder coat finish with a glossy, chrome-like appearance. It is not chrome plating. • Steel components used with Matte Black Texture and Bronze Texture may have minor surface blemishes acquired during the manufacturing process. These superficial variations will be hidden by the powder coating and do not affect product performance. ▸ Does Goldberg Brothers make barn doors, too? No. We make the steel hardware for mounting barn doors, but we do not make the doors. You can purchase barn doors from most of the retail dealers that sell our hardware. You can also make your own doors with our Barn Door Edge Wrap kits. ▸ What is the maximum door weight your hardware will allow? For recommended maximum door weights, see our Barn Door Weight Limits chart. ▸ Can I use your barn door hardware outdoors on my patio doorway, garage or shed? Some homeowners do use our barn door hardware for outdoor installations. Keep in mind, though, that our powder-coated steel barn door hardware and shutter hardware will eventually rust if used where it will be exposed to rain, running water, or high humidity. Outdoor installation voids the warranty and may shorten the product's service life. We recommend our Stainless Steel series hardware for outdoor use. ▸ I have a farm. Can I use your barn door hardware on my real barn door? ▸ Will your Shutter Series hardware protect my home in a storm? Probably not. Window shutters mounted on our Shutter Series hardware should only be used indoors and for decorative purposes. Consider them an alternative to curtains or blinds. ▸ What does the MP stand for in MP Series? MP stands for Multi-family Projects. MP Series is our product line originally designed for apartment buildings, hotels or office buildings where an architect or contractor wants to install dozens of identical sliding barn doors at a lower cost that our Standard Series products. However, you can buy MP Series products for just one or two doors, as well. 1- MP Series roller hangers are factory-equipped with DuPont™ Delrin® silent rollers. 2- The tracks are made with 1½″ × 3⁄16″ steel for use with lighter-weight doors. 3- MP Series kits, tracks and most accessories are available in three colors: black, silver metallic, and architectural bronze. ▸ Where can I find info about your MClad cabinet facing products? You can learn more about Goldberg Brothers MClad® powder-coated steel cabinet facing on our main GoldbergBrothers.com website. ▸ Are you the same Goldberg Brothers company that makes film reels? Yes. Goldberg Brothers, Inc. has been around since 1897. We have manufactured a wide range of industrial and household hardware products. Film reels were one of our most successful product lines for several decades. We still make a few film reels, projection ports, and other hardware products for movie theaters. We also make tables and other home décor items from our film reels. Visit our other website, goldbergbrothers.com, for details. ▸ Are you the same Goldberg Brothers that...? Goldberg Brothers, Inc. has always been based in the Denver, Colorado area. We are not associated with similarly named companies or people (past or present) based in other cities around the USA. And that story about the Goldberg Brothers and their automobile air conditioning? It's a joke. ▸ I have one of your old film reels. What is it worth? This question is way off-topic for our barn door hardware website, but we will give you the short answer anyway. Your vintage Goldberg Brothers film reel is worth whatever you think it is worth -- or whatever someone else is willing to pay you for it. We recommend that you just hang it on your wall and enjoy it.